WhatsApp and FB Messenger is one of the best android apps for mobile messaging in android phone. 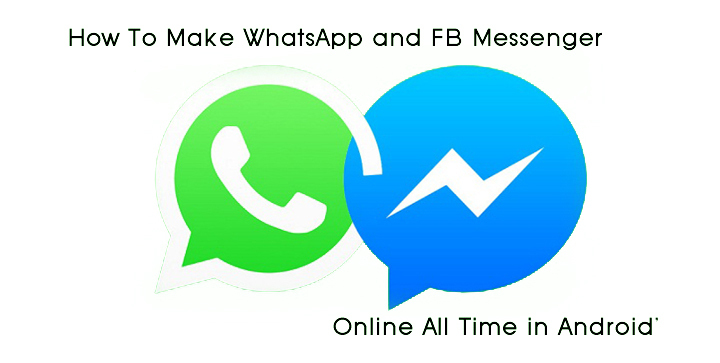 In this trick you can make your FB and Whatsapp apps always active in your android mobile with the help of two possible ways that we have discussed right here with which you will always appear online on these giant social networks. This is one of the amazing tricks for fooling your friends by always stay online. In this post, we will show you how can your make your Whatsapp and Facebook status always online from simple settings. First of all make sure you are running the newest version of WhatsApp on your phone. Then go to your Phone Settings. This option may be different on your phone. But, you have to select the Screen turns off automatically option. As you select Never option your mobile screen will never go to sleep until you press the lock button. Now you just have to switch your device network ON and then open your account on FB or WhatsApp. Your screen stays on, then your “Last Seen” also stays online. Hope you like it.